AMD’s plans for Vega 10 are starting to come together, and if the latest rumors are accurate we could see the company show off the long away next generation Radeon products by the end of the year. With the release of Vega 10, the company are hoping to counter Nvidia’s iron grip of the high end graphics markets they’re currently enjoying thanks to the GeForce 10, GTX Titan and P100 lineup, spanning both retail customers and professional users. These rumors from Fuzilla point to Vega 10 likely being shown off in November (really leaving the Supercomputing show as the only logical option, unless AMD are planning on hosting their own event again such as with the original Polaris announcement). From what has been whispered, Vega 10 will debut with a rather impressive 16GB HBM2 memory, but will likely be available in limited quantities and as such the company will be targeting Vega 10 first at both professional graphics market and compute orientated functions. If this holds up, we should start seeing volume production ramp up sometime in early 2017, so by the end of the first quarter it should (in theory) be readily available for retail customers. 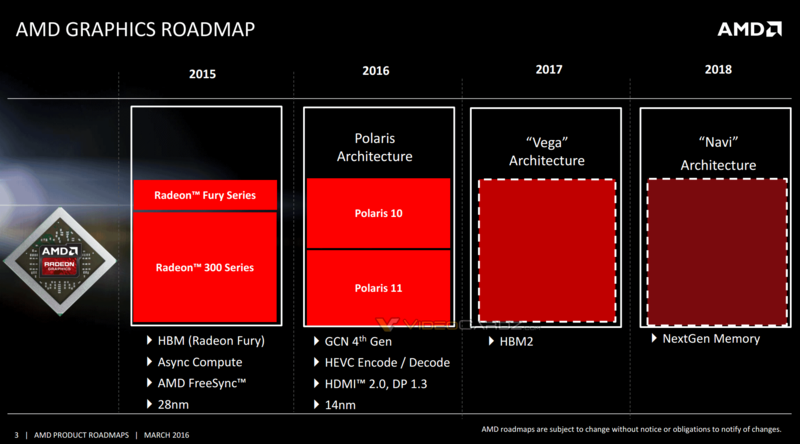 We’ve already discussed at length AMD’s plans for Vega 10, Vega 11 and Vega 20 graphics cards. But in case you missed it and don’t want to click the link – Vega 10 will be the bleeding edge cards aiming to take on Nvidia’s highest end GeForce cards. Vega 11 meanwhile will replace the current Polaris desktop line up – a pretty interesting move, but apparently an accurate one. 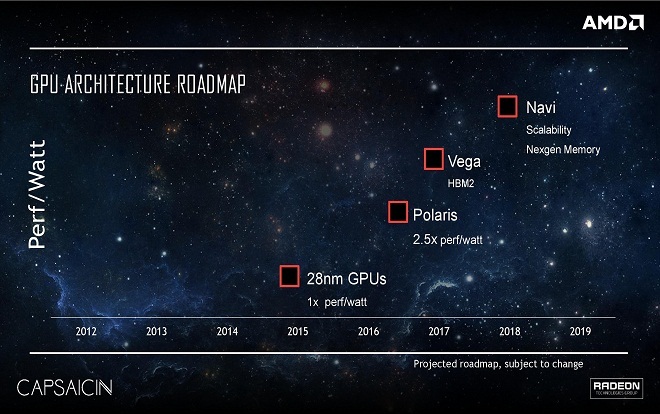 From what AMD have uttered (which isn’t much) during interviews, Vega isn’t just Polaris 10 with extra Compute Units, but a faster, more efficient design. It’s quite interesting because with news Nvidia will be readying a GeForce GTX 11 series card (which are essentially a tweaked Pascal refresh) for 2017, there’ll be a lot of duking out between both team green and team red. Nvidia are also planning to release a GeForce GTX 1080 Ti – which will perform pretty darn closely to that of the Titan X Pascal. Judging from the various earlier leaks, we’ll be seeing Vega 10 shipping with 4096 Stream Processors, and will likely put out well over 10 (around 12 is being touted) TFLOPS of single precision compute performance – which is pretty insane. We can presume by these leaked performance numbers that the clock speed of the GPU core is probably going to be between 1400 and 1500Mhz. For those folks who don’t feel that 12 TFLOPS is enough, there’ll apparently be a dual Vega 10 part – which we can presume will feature double the number of shaders, but possibly lower clocked cores for the sake of the cards TDP – but that’s not been fully confirmed yet (so for example, clocks could be something like 1200 – 1350Mhz). From a pure product standpoint – this should mean that AMD’s current processor and graphics lineup should switch significantly in the coming months – whether you’re a home user or a professional customer. Zen / Summit Ridge will be available in volumes by early next year (2017) and going by the latest news, AMD will also have Vega 10 ready too. Tagged with AMD, gpu, graphics, polaris, technology, vega 10, vega 11.